AirAsia flight number QZ8501, bound from the Indonesian city of Surabaya to Singapore, has lost contact with air traffic control, the airline has confirmed. The missing flight is an Airbus A320-200 with up to 161 people on board. Indonesia air transport authorities have provided details of the plane’s last position. "We are coordinating with the rescue team and looking for its position. We believe it is somewhere between Tanjung Pandan, a town on Belitung island, and Kalimantan," Indonesia's air transportation director-general Djoko Murjatmodjo stated, as cited by AFP. Also, air force spokesman Marsma Hadi Tjahjanto confirmed that the Air Force was using the last point of contact to conduct an air search. AirAsia has stated that there were 162 passengers on board: 156 Indonesians, one Singaporean, one Malaysian, one French, and three South Koreans. "At the present time we unfortunately have no further information regarding the status of the passengers and crew members on board, but we will keep all parties informed as more information becomes available," the company said. It added that "search and rescue operations are in progress and AirAsia is cooperating fully and assisting the rescue service." #AirAsia#QZ8501: "Thank you for all your thoughts and prayers. we must stay strong," AirAsia Chief Executive TonyFernandes said on Twitter. Airbus has said in a statement they will assist the French safety investigation authority (BEA) and other authorities responsible for looking into the missing flight. The plane could seat up to 180 passengers. The company added that further factual information would be provided as soon as details had been confirmed and cleared by authorities. "The thoughts of the Airbus management and staff are with those affected by flight QZ8501," the statement read. 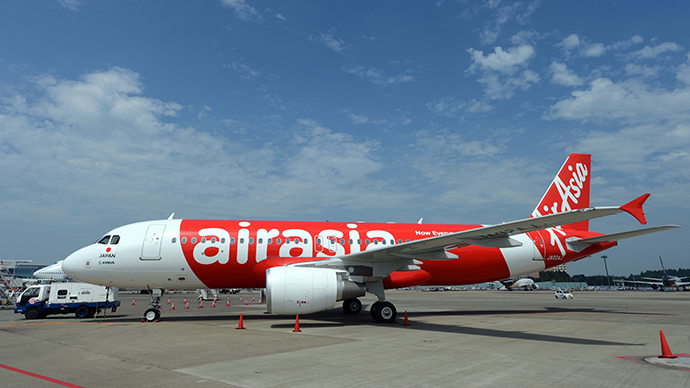 Malaysian low-cost airline AirAsia is believed to be one of the safest air carriers in the world. Until today there have been only two incidents with its aircraft. In both cases they overran runways. One took place in November 7, 2004, at Malaysia’s Kota Kinabalu airport (Flight 104, Boeing 737). Another incident with Flight 5218 (Airbus A320-200) occurred in Malaysia’s Kuching on January 10, 2011.